Sarwat Chadda's Blog: ooh, Shiny! Well, the US edition is out, like, by the time you read this. Disney Hyperion have done a fabulous new website with many, many opportunities to win copies of the new edition with its glamourous cover (which will look very cool next to the blood red cross of the UK version, don't you think?). Do check it out immediately! I did want to do the presentation dressed up as a knight, or Batman, but alas, it was all a bit too short notice. I've had so much amazing support in getting to this new stage of my career, and whilst there's something very special about the first time you see your ms as a book, thanks to Puffin, the US part of the business is pretty awesome. I'm due back to the Land of the Free on the 27th September until the 4th October. I know I'm in Texas on the Monday, at Kingwood High School, but not much else. I had a great time visiting in May for the BEA (and a big HI THERE to the Immigration bods at the airport, boy did I get a lot of mileage out of that incident) and looking forward to a bit of a whirlwind tour in a few weeks. I'll put up the details as I get them, if I happen to be in your neighbourhood, do pop by and say howdy. I am extremely excited about this trip, it should be a good one. My only question is can I get my Templar Sword through customs? So, in no particular order I'd like to thank Ari, Jonathan, Deborah, Donna and the rest of the crew at Disney Hyperion, past and present. Cheers and see you guys in a couple of weeks. Oh, Ari, thanks so much for all the Elephant and Piggie books. Insane! 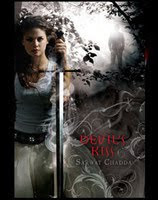 I loved 'Devil's Kiss'! Now I want to share my enthusiasm for the book and possibly win a signed copy on twitter BUT (and I'm new to twitter and may be being very thick here), don't you need to follow the people who want to direct message you? ie you could direct message me because I follow you but not vice versa? any help appreciated. PS I'm amscribbler on twitter. Thanks. Very shiny and very wonderful. Loved the video, nothing personal but I think the batman kit might have been a tad scary! Happy happy release day, Sarwat. Already put my two cents in about the tour. Although, really, my opinion is about worth that much. Morning Scribbler, Sorry, but I should have got back quicker. I think you just follow the link via the US website and 'follow' devilskiss and then send a direct message to it. I think. Gosh, this Twitter is quite complicated. Ta, John! I did have a Superman outfit many years ago. I even wore it to the cinema (under my school uniform) when I went to see the first Superman movie. Just in case a cat got stuck in a tree or a meteor threatened to wipe out London. You know your opinion is worth so much more! A dime, for sure!